Marketing is a great tool for promoting your exhibition stand and increasing your visitor rate prior to an expo. Your trade or consumer show success will undeniably be impacted by level of engagement your stand receives on the day. Implementing pre-show marketing methods can help you secure a high level of engagement, saving you the stress of having a lonely stand on the day of the show. There are several promotional tactics you can use to enhance your visitor rate. Marketing can seem like a daunting and difficult process for those that aren’t experienced but there are some very simple steps you can take to ensure your trade show exhibit is a success, before you even get there. Before jumping into your marketing plan, you need to determine what you hope to achieve at your exhibition display. Setting your expo goals is an extremely important step your business needs to take when deciding to exhibit as it influences everything from the stand design and budget, to your staffing and the marketing plan. If you haven’t created your expo goals for 2019, you can follow the tips and tricks we’ve put together for you in our blog post here. The approach you take with your marketing plan will depend on what your goal is. This is because you can use your goal to position your marketing creatively and competitively. For example, if your goal is to generate sales then your marketing content can focus on exclusive offers at your display stand. No matter which marketing tactics you choose to use you will need the correct contacts to target or send content to. Throughout the pre-show marketing process, you should be using two strategies to engage with contacts. The first is to utilise your company’s current customers and prospects, inviting them to visit your display stand at the expo. Whether they are attending the expo or not, it’s a great idea to remind your customers that you are exhibiting as it displays a strong commitment to your audience. The second is to target your communication tactics to the expos registered attendees. You will be able to obtain this information from the expo organisers. Invest time into collating contacts that you would like to see at your display. These visitors could be buyers, media representatives, decision makers or international visitors. Developing a landing page is a great way to share useful and exciting information about your display stand and the trade or consumer show. Include details of date, time, location and stand number so people can easily add it to their calendar and find you on the day. Having a landing page gives your target audience somewhere to go to find more information. To help your marketing tactics stand out you can add a unique and competitive element to them. This will help you attract more attention and increase engagement with your content. Consider having a competition and letting that be the focus of your marketing tactics or offer something exclusive to visitors who visit your display as directed by your marketing. Offer prospects appointment times or exclusive demonstrations of your product/service at your exhibition display. The goal of your marketing plan is to generate forms of media that can inform, entertain and engage an audience enough that they commit to visiting your display. There are three main types of media; paid, earned and owned. Your choice of this will depend on your resources, skills and budget. Paid media includes all online or print tools that have been paid for. This can be Google Ads or an advertisement in the local paper. Earned media includes media that has been achieved through pitching, sharing on social media or direct mailing. This can be word of mouth or SEO content. Owned media is your organisations generated media. This includes content marketing, emails, direct mail, social media, websites or landing pages. Keep your follows and prospects up to date by posting details of the expo to Instagram, Facebook or LinkedIn. Share photos of the venue, behind the scenes of the stand manufacturing, your staff to introduce them or sneak peaks of products you are offering. Social media is a great form of communication as it allows you to interact with your followers. This helps you build a positive relationship with prospects before the expo has even started. Emails are a great way to communicate directly with prospects. Turn cold emails into well-thought personalised invitations including details of the expo and your stand. In the time leading up to the expo, add the event details into the footer or signature of your email so everyone you communicate with will be aware of your exciting plans. This is an easy and cost-effective way to build engagement and increase attendees at your stand. Sending traditional, hard-copy mail can help you reach out to specific exhibitors and prospective clients. You will need to ensure your mail is reaching the correct people, so do some research before you begin sending anything. E-newsletter are a great way to present a large sum of information in a visually pleasing and efficient way. Send out e-newsletter advertising for your display stand at an expo to your contacts of current customers or expo attendees on a weekly or fortnightly basis. Alternatively, you can research current mailing e-newsletters that companies within your industry send out and request or purchase a feature in this. Research has stated that ‘40% of people will respond better to visual information than plain text’. Info-graphics and posters are a great way to turn lengthy information into a visually pleasing and exciting method of communication. 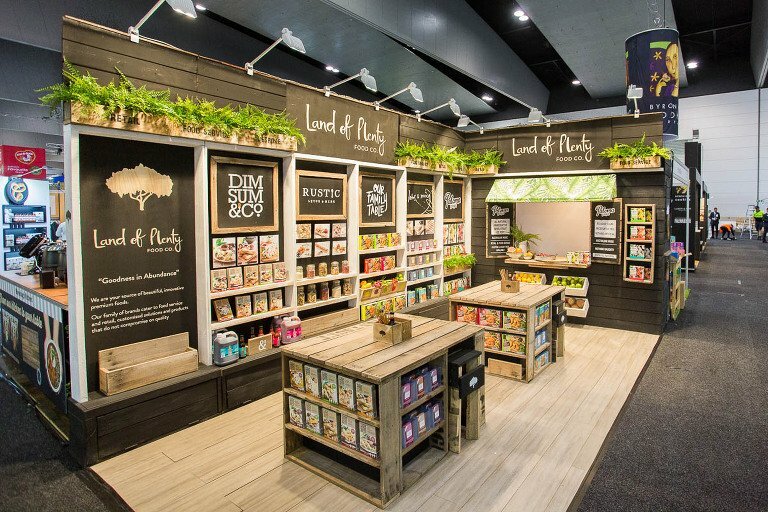 An eye-catching and unique design can enhance your positive image and encourage people to invest time into your business at an expo. Whether you choose to send these via email, mail or take a Guerilla Marketing approach and hang posters on the streets, you can guarantee your audience will be intrigued and excited about your exhibition stand. Start informing people about the expo 2-6 months before it’s date. This will allow people time to add the date to their calendar and make arrangements to attend. Apply your marketing plan and begin promoting your individual display stand roughly 1-2 months before the expo date. Use social media, mail, email, info-graphics, or e-newsletters to spread the news. Remember to stay positive, encouraging and welcoming!